Light: Bringing opposites together. Moderating your actions or emotions. Finding middle ground. Reaching compromises. Synthesizing solutions that please everyone involved. Using the old to make something new. Shadow: Going to extremes. Disrupting group efforts. Ignoring healthy approaches to life. Becoming an addict. Practicing gluttony. Tearing something or someone apart. Breaking alliances. Mythical/Spiritual: The angel seen here may be the goddess Iris. By extension, priests, priesthoods, or the transfigured Christ. Story: The main character learns to moderate impulses or habits that limit his or her ability to solve the story’s central problem. Relationships. Set superficial relationships aside. Pursue trust and deep intimacy—the subtle blending of two people into one. Bring people together. Commit to introductions, parties, or gatherings. Seek out groups. Work. Many hands make work easier. Call meetings. Get input from every level at every step. If everyone has a hand in defining an effort, then everyone will feel ownership and investment. Moderate your tendency toward all-or-nothing work habits. Spirituality. Some spiritual advisors recommend extreme practices, from fasting to abstinence, as a means of boosting spiritual awareness. Consider the potential value of moderation in all things. You can value what is right here, right now, without craving more or surpassing healthy limits. Fortune Telling. Someone’s using drugs or alcohol to excess. It’s time to get back on that diet. The square and triangle. In many RWS-inspired decks, a symbol on the angel’s chest suggests the fiery spirit enshrined in stable matter. What meaning do your possessions have beyond their physical value? The blended cups. 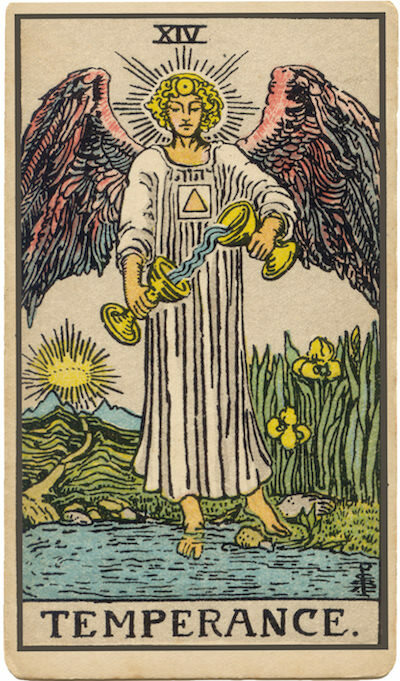 Temperance often pours the contents of two cups together, blending water, water and wine, wine and milk, or even fire and water. How might blending two opposites resolve your challenge today? Land and water. Occult decks frequently draw Temperance with one foot on stable land and one foot in emotional water. A dive-in-or-get-off-the-dock approach assumes extremes are the only options. Are they? Irises. The flowers seen in RWS-inspired illustrations suggest their namesake, Iris, the goddess of the rainbow. What would happen if you reduced your situation to its most basic components, as a rainbow breaks down white light? How can I avoid extremes? What does everyone involved have in common? How might combining familiar things help me create something new?